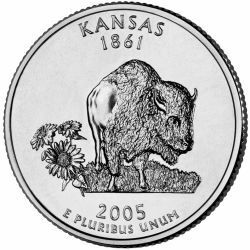 Kansas State Quarters are the 34th variety in a series of fifty design changes over a ten year period from 1999 to 2008. This Quarter was released into circulation on August 29, 2005. The reverse of the Kansas quarter is very simple. It features both the state animal and the state flower. The bison and the sunflower have both been very well known symbols of Kansas since before it was ratified in 1861. The reverse of the coin bears the inscriptions "KANSAS 1861” and "E PLURIBUS UNUM" along with the date of 2005.